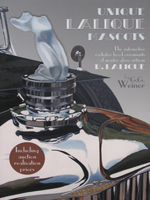 Twentieth-century French glass designer René Lalique was known for his art deco creations of glass art, perfume bottles, vases, jewellery, chandeliers, clocks, and - the unusual subject of this book - car radiator cap ornaments. Stunningly beautiful and now highly collectible, these glass mascots range in design from a peacock's head to the goddess of speed, from a boar to an owl, from a fox to the King's greyhound, some in clear, strikingly coloured glass, others frosted, some electrically illuminated and all with their Lalique provenance etched somewhere into the glass. In this book, which features a foreword by Lord Montagu of Beaulieu and a preface by Eric Knowles of Antiques Roadshow, G.G. Weiner, himself a dealer and specialist in the subject, looks at each design in some detail, gives an idea of what it may be worth (depending on its condition and rarity), and offers advice on buying and looking after these objects d'art that are a joy to own as well as quite possibly being a shrewd investment.